This lightweight wrap consists of two rectangles, knit separately and sewn to form a “V”. Originally designed for Vogue Knitting in a palette of neutrals, it gets new life in vivid reds! Featured as L-Shaped Stole in the Knit red book. Purple shawl photo by Rose Callahan. Copyright © 2012 by Soho Publishing/Sixth&Spring Books. 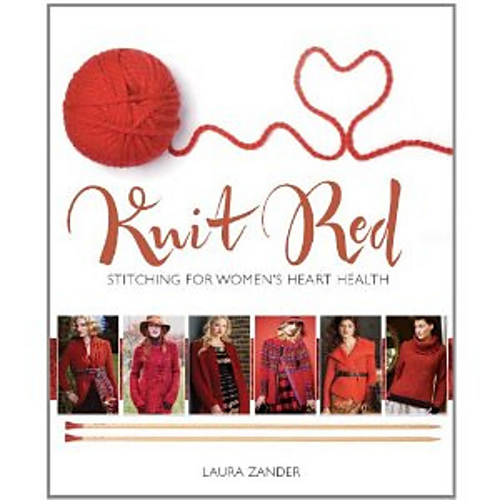 From Knit Red by Laura Zander, published by Sixth&Spring Books. A portion of the sale of this book is going to support The Heart Truth, a campaign by the Foundation for the National Institutes of Health that helps to create awareness about the #1 killer of women in the US- Heart Disease. This book is also a part of the Stitch Red campaign. One long and one short, rectangles are joined together in a textured mosaic in this all-season lightweight wrap. Edges are finished with reverse stockinette stitch. • 18”/45.5cm wide by 54”/137cm long (length is measured from inside joining point of back neck). • 18 sts and 25 rows = 4”/10cm over pat st (after blocking) using size 5 (3.75mm) needles.